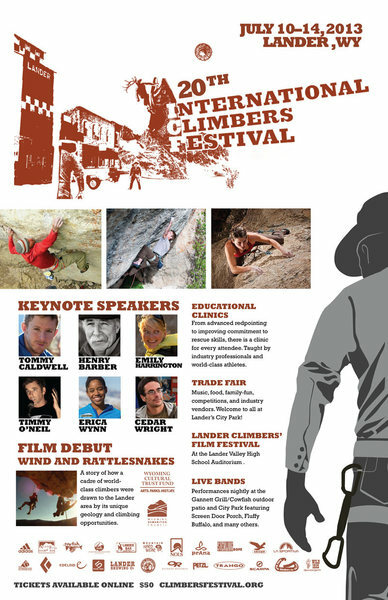 “This year marks the 20th International Climbers' Festival, and the celebration is going to be big. We have recruited a huge line up of presenters (Tommy Caldwell, Henry Barber, Emily Harrington, Timmy O'Neil, Expedition Denali's Erica Wynn, and Cedar Wright). Our clinic schedule features top athletes like Jonathan Siegrist, Audrey Sniezek, Eric Horst, Nick Duttle and many more! Though, the biggest anticipation of all is debut of the HIstory of Lander Climbing Documentary (click here to view a trailer) at the festival. I think in this past year we have served our community well!